So when Mother’s Day rolled around, my husband secretly schemed to surprise me. He woke up all three of our small children at 5:30 a.m., loaded their sleepy heads into our minivan, and made the one hour drive into NYC, right to the front door of Murray’s Bagels. He bought a dozen bagels and a mug. I’m still not sure why he bought the mug, especially since I didn’t drink coffee. I guess when you drive an hour for a bagel, it makes you feel better to throw a mug into the equation. Almost three hours later, they arrived home to find me still sleeping. He woke me to say he was taking the boys to breakfast so I wouldn’t have to cook or clean up before church. “Take your time and we’ll meet you at church,” he said, as he walked out of the bedroom. As you can imagine, I was quite pleased. When you have three kids under five, an extra bit of sleep is no small thing. So, I fell back asleep for another hour and woke up just in time to shower and hurry out the door, leaving the bagels untouched on the counter. I should note that I noticed the bagels on my way out and my heart swelled. I felt so loved. But there was no time to eat. No more words were whispered. No more glances of love were shared. I was confused until church ended. That was when Mike let me know--in no uncertain terms--that I’d ruined his glorious plans for the day by not eating a bagel. Evidently, that bagel was only the beginning of the surprises he’d planned for me. Now it was time for me to have lunch with a friend at a special spot so there would be no time to enjoy the bagel he’d spent threehours getting. This is when it got ugly. I reminded him that the only thing I asked for was a slow easy day at the beach with him and the kids. I didn’t need fancy reservations or big gifts or even bagels. I just wanted rest and relaxation. Fortunately, neither Mike nor I take ourselves too seriously, and more importantly, we like getting along more than we like arguing. So, for the sake of the kids, we threw our beach chairs in the trunk and made our way to the beach with the bagels in the beach bag and rosé on ice in the cooler. When we arrived at the beach, I settled into my chair and Mike took the boys into the ocean. It was finally time to eat that ever-loving bagel, and that’s when I found it. “It” being the long love letter Mike had tucked into the brown bag of bagels. He knows how hard I am on myself about all of the mistakes I make as a mom, and he wanted to assure me that the love I give to my kids covers the mistakes I make with my kids. His words provided the relief my heart craved. The gifts we moms want for Mother’s Day are as varied as we are. Some want shoes, some want jewels, some want bagels, and some want spa treatments. The one thing we all crave is relief. “I’ve totally got this parenting thing nailed, and I’m basically crushing it as a mom,” said no mom, ever. We want relief from feeling like we have to get it all right. We want freedom from the pressure to be all the things, all the time. We want to know a bad day doesn’t mean we’re bad moms. We want relief from feeling like no matter how much we do, and no matter how hard we try, we are never, ever enough. If you’re a mom of a toddler or a teenager or a grown adult with children of their own, your heart probably longs for freedom from the lies, too – lies that threaten to steal the adventure and wonder from the journey. Lies that leave you stuck worrying about the ways you’re falling short and the people your children will therefore become. Lies that leave you stuck in fear that you’ve messed up too much and the well of grace has run dry. Lies that leave you stuck in shame because you know the words that have been flung behind closed doors and the wounds that have been inflicted, and you doubt that forgiveness and healing are for you and your children. So on this Mother’s Day, may I have the honor of breathing some truth into those suffocating lies? May I have the honor of helping you push back the pressures of parenting with the truth of God’s Word? Relief is waiting for you. Freedom is calling you by name. What we get right and what we get wrong does not ultimately determine who our children become. Our children’s futures aren’t wholly dependent on our ability to perfectly orchestrate their lives. Our job is to be our child’s parent, not their Savior. God already has that covered in His Son. Our children don’t need us to be perfect. They need us to point them to the One who is. And that One is Jesus. And finally, my friend…we can trust God with the children He has entrusted to us. Because as hard as we will try to get it all right, we will sometimes fail. But confessing that doesn’t make us failures, it makes us free. FREE! Free from the hopelessness in which we get stuck. Free to unclench our fists that are trying to control outcomes. Free to parent opened-handed in the confidence of God's faithfulness. And it makes us moms truly grateful for God’s great grace that is bigger than our biggest mistakes. 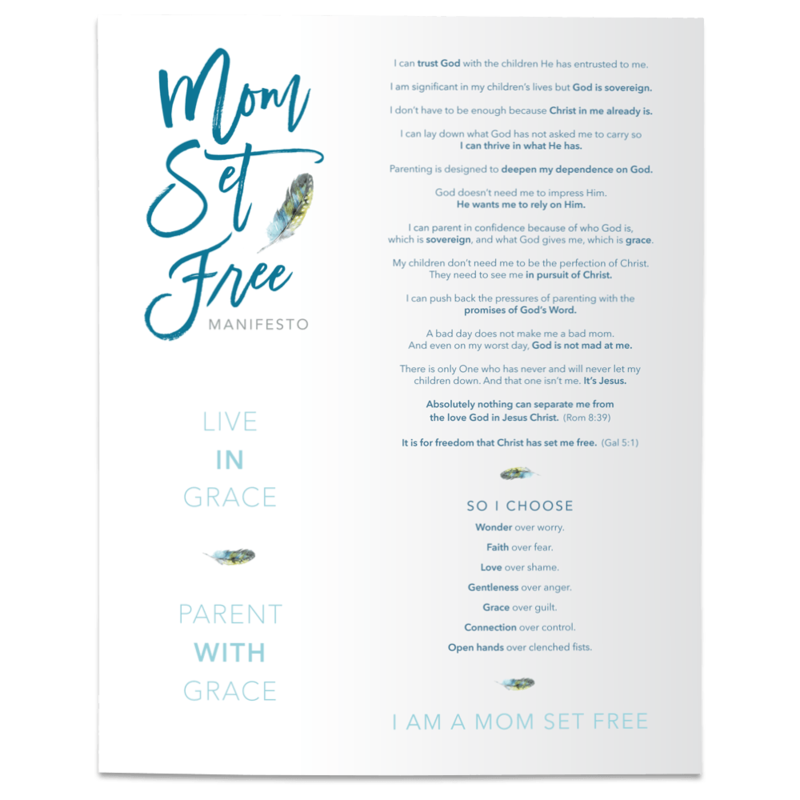 You are a "Mom Set Free." See, freedom is already yours, but you may struggle to enjoy your freedom because of all the pressure you are under as a mom. You feel like you’re anything but free. You feel stuck. I can write about feeling stuck because I lived so much of my life that way. As a mom of four boys who range from teenager to toddler, I know how it feels to live stuck in worry and fear and shame and guilt. But now I know there is a better way. A way that is offered to each and every mom, no matter how far we’ve fallen or how far behind we feel. Will you join me on the path to freedom this Mother’s Day? Let’s give our hearts the one thing it most craves. Relief.